This Cajun Injector Propane Gas Turkey and Seafood Fryer device is a 30-quart capacity that fries turkeys that are up to 18 pounds. The unit runs on propane and comes with a bailing basket and a very sturdy base. The legs on the base are wide so it is more secure and it has a leg ring for even more security. 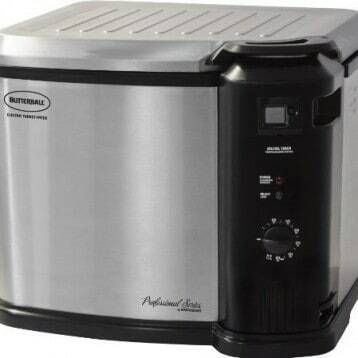 This unit works well for outdoor cooking of fried turkey, boiling seafood, and steaming a variety of foods. It has a regulator and hose and the LP gas cylinder is not included. There is a wide-handle lifting hook for convenience and safety as well. There is also a thermometer mounting bracket and a drain clip that allows for the convenience and safe measure of draining grease out as opposed to having to pour it out and therefore risking injury. A detailed manual is included. A cast burner is in the mix too. There is a timer with automatic shut-off so you never have to worry with overcooking. The solid-steel fry pan is 15” tall and has a base that is for the pot to sit on. The reviews on this product were decent in nature. Some stated the fact that they had problems with the flames and others commented that the basket was small. The basket hook was also said to be on the small side. The timer was also mentioned as an issue several times. But, it was said by many, however, that this device was reliable and durable and that it made a fairly good fryer, overall. The base being sturdy and there being a leg ring in the package deal was a huge positive for those who shared reviews especially due to the fact that flimsy legs could pose as an extreme hazard. For those who ended up with timers that functioned well, the timer device and automatic shut off were praised as a plus on this unit as was the mounting bracket. Assembly was said to be easy and the manual very helpful. There were a good number of incidences where all the parts were not in the box upon receipt or the parts looked dingy. It was said the metal cleaner is necessary in order to properly clean the device but that when it is used, it is fairly easy to clean. One reviewer wrote in that he had purchased the fryer for the purpose of brewing beer. He said it boiled the water easily but that it starting the flame did not go so well. The 20 minute timer was said to be a plus by this reviewer in case there had been oil rather than water in the container but did say that when trying to specifically boil water, the automatic shut-down was not a good thing. What some did not like was that the spout sometimes clogs up making it difficult to empty the grease and, therefore, presents a problem as to how to get the grease out. Others said that there was not a turkey rack included so they had to purchase one separately. Some felt that the assembly was not easy although others stated that it was simple. Click here to view prices on Amazon and find the best deal on the Cajun Injector Propane Gas Turkey and Seafood Fryer.